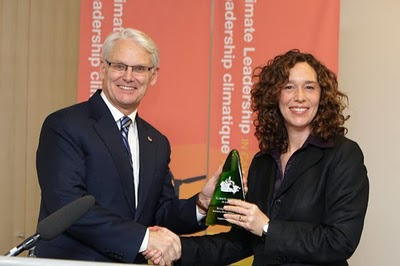 [photo] Ms. Berman presenting a “Green” Award to former Liberal Party of B.C. premier, Gordon Campbell … the man who privatized British Columbia, sold it to General Electric and other international corporations, who built highways across farmland and called it “green;” who reversed dioxin effluent safeguards that we fought for and instituted in B.C. to protect our water; who sold off the public and natural heritage of British Columbia and opened the doors to General Electric to occupy hundreds of watersheds, devastate riparian ecosystems, and destroy forests for transmission lines to carry expensive power to mines in the north and to sprawling cities in the U.S. – Photo source: BC government. Before Tzeporah Berman began her current position as head of the North American Tar Sands Coalition, Tides Canada had already established these structures to create near-total control over budgets– and therefore, most decisions– for staggering numbers of organizations. Berman was around at the time, working for PowerUp pushing forward offsets garnered by river destruction. Some of the participant organizations already had working partnerships with multiple tar sands producers. The over-whelming majority were already greased by primarily high donors and foundations. Thus, joining the NATSC meant, essentially, double dipping. The Tides Foundation began the NATSC as a project with earmarked funding coming from other large philanthropic foundations. This unelected and unseen structure was created to stand as a vehicle to help forge a similar backroom strategy for and likely negotiation of a “final agreement” to end campaigns against either certain segments or corporations involved in tar sands, likely borrowing from concepts involved in crafting similar deals with forestry corporations. In 2009, as a part of producing Offsetting Resistance, a full strategy paper document was leaked to myself and Dru Oja Jay. It was an internal paper from a few months prior that outlined the secret nature of the coalition, the internal structures, the over-all short, middle and long term goals of a foundation funded, and foundation directed entity that was earmarked as a project of Tides Canada, and not as a separate NGO. The pressure applied and leveraged would be out of the hard work of other people. The people who had worked at a community or first nations grassroots level were not only to not be consulted, if deal negotiations were to happen it was without anyone but a select few ever knowing anything about it. Until the press conference. Though there are many problematic proposed solutions contained within the program (carbon offsets, for example), this was written by Michael Marx, then head of Tides’ Tar Sands Coalition in 2008. Specific demands, strategy and more may well have moved on, especially in the face of new coalition partner, Bill McKibben, and the PR group that has brought the world 350.org. Pipeline struggles, in years past, were not as heavily focused upon as now. Keystone (both of them) gets only a whiff in the paper by name; Enbridge Gateway is described but not named. Indeed, how times have changed. The quote above was a letter penned by President and CEO of Tides Canada, Ross McMillan. When the Great Bear Rainforest backroom deal was announced, it was publicized as a triumph of “Rainforest Solutions Project,” then comprising ForestEthics, Sierra Club BC, Greenpeace Canada and the Rainforest Action Network (RAN has since withdrawn support for the agreement). Tides was then, to use their jargon, “invisible to the outside,” but now speaks publicly as both a “stakeholder” and financial lifeblood. Now they advertise prior secretive involvement. “Purchasing” staff means that a person who is acting in the capacity of the directives of the paymaster coalition is never to public refer to the actual job, or even the organization. As such, even though someone took a leave from, say, the Pembina Institute to become a coordinator within the Tar Sands Coalition steering committee, and cashed paycheques from Tides referencing this work, they would publicly identify with their former employing organization, the Pembina Institute. In fact, the above perfectly described the Canadian tar sands coordinator for Tides previously, Dan Woynillowicz. Google his name and he appears only as Pembina. The fact that demands, media, talking points, statements and interviews and paydays all then came from Tides direction was to “remain invisible to the outside.” He stepped aside for Jennifer Lash, who appears publicly as Executive Director of Living Oceans BC. She is, in fact, coordinator of Tides Canadian section. Michael Marx is the former “lead coordinator” from the tar sands steering committee, above the American and Canadian coordinators. These three, in collaboration with media coordinators, form the power nucleus. Other foundations centralize campaign contributions to the Tides Coalition, and will re-direct appeals for tar sands funding to the national coordinators from this one group. This has effectively narrowed the overwhelming portion of all tar sands funding from foundation sources, leaving astronomical power in the hands of an unseen entity. How does the final say evolve? According to Marx while he was still coordinator: “While NGOs generally prefer a network structure that allows for maximum communication, and minimal centralized control, foundations investing most heavily in the campaign have a vested interest in exercising some control over the process”(emphasis mine). Michael Marx has moved on as mentioned, for Tzeporah Berman to become head of the North American Tar Sands Coalition. Marx himself is officially a campaigner once again with the Sierra Club in the United States. The “Tar Sands Solutions Network” appears to be the vehicle for a public face to negotiate a “win-win” deal. A couple of years ago, the Mediacoop.ca and later on the Globe and Mail reported a leak of an attempted “fireside chat” that was to happen with no fanfare, media or record of its existence. This chat was to involve some of the largest players in energy corporations operating in the tar sands, “with beer in hand” alongside some of the more compromised and right wing environmental organizations. That particular meeting was aborted after the leak. There are other secret meetings as well, ones where you have to sign before hand not to release any information about what is discussed. There– without the input of the multiple indigenous communities and other active community resistance movements that target tar sands on both sides of the colonial border– strategy for the short, middle and long terms are drawn up. Foundations spring for the event, foundations also “influence” talking points, strategy is laid out and so on. Recently, for example, there was such a meeting held off the coast of British Columbia. People who organize in other areas would likely know many of those who attended. Attendees are all sworn overtly not to speak out about its mere existence. The coalition is the same invisible Trojan Horse that so many “collaborative model” agreements have come from in the past. Berman is simply the public face of capitalism’s last ditch attempt to save itself. The system needs reinvention as it collapses under strain, and the new class of would be green capitalists seek to emerge out of this crisis like Henry Ford did from the Depression. Exploitation of the working class, continued indigenous colonialism at home, war mongering imperialism, permanently expanding growth economics– all with climate effects being transferred onto the over-exploited majority world– this is all “just the way things are,” because “we don’t have time to try and transform the system,” and so on are invoked in defending a strategy of accommodation to capital. The reality is it results in defeat; the tar sands are a cornerstone– as is all oil– to a growth economy. Fracking, tar sands, offshore, coal to liquids, mountain top removal and the prize of Utah and Colorado’s oil shale, every last bit of it and more must be opposed. Growth is the problem. Green capitalism is a false promise to unite a growth economy with a healthy atmosphere. It is a lie. If the economic framework of assigning value to land to be converted to resources for dollars is not challenged, oil will continue. It is not a renegade or rogue industry. It is a perfectly normal, capitalist industry. Big Energy’s power is a reflection of the centrality of energy, leading to influence. It is a logic completely at peace with accumulation of profit and the dominance of capital. More than “not a rogue industry,” it is the flagship, the pinnacle of industries under late industrial capitalism. Oil exploitation has existed in every industrial society of the last few centuries; however, like the arms industry, the power nexus of its placement in the over-all economic structure of the West makes it absolutely impossible to decouple a dismantling of the power structure with any hope of weakening some falsely labelled “rogue” industry. We need at minimum to declare no right of any backroom negotiation around tar sands. Nothing can green them, nothing can legitimize discussions. Public or private. Growth is the elephant in the living room we must confront. We must reject a “green shift” that panders to “have your cake and eat it too” eco-populism, the lefty-green rhetoric of a new green bourgeoisie trying to burst forth. By making capital sacrosanct (“[F]oundations investing most heavily in the campaign have a vested interest in exercising some control over the process.”), the negotiation process cannot do anything about the situation of capital dominance. Capital is most dominant in the North American political party system. The pro-Obama language of the “Tar Sands Solutions Network” likely indicates a nod to board member Bill McKibben, whose own Rockefeller funded, pro-Obama organizing in 350.org has become stuck on a hamster wheel chasing the Keystone XL. Simply put, the same PR professional thinking below the border that designed the Democrats’ Moveon.org are now more than likely having influence on crafting part of the over-all trajectory of tar sands big money organizing. Brand Obama sells, but the products are made of oil. The people who would negotiate away the work done in other diverse communities are unseen, unelected, unaccountable and have friendly relations with large corporations for a reason. They are not even a large minority of those organizing in opposition to tar sands and the energy industries, however. Those whose resistance have done the most to create this situation? Some have warm relations with certain facets of Big Green, but all have organized independent of Big Green structures, built separate movements of their own, evolving community directed demands. Through a process of building, what it is that cannot be negotiated has evolved for every different movement in their own manner. There is not just one movement, and there are just as many different sets of principles. Impacted indigenous communities are building opposition to Line 9 expansion with allies of theirs from outlying communities; People in Utah & Texas are engaged in creative responses of resistance to proposed tar sands mining or pipeline construction; indigenous territory has been reclaimed and rebuilt blocking all energy pipeline construction: Tar sands oil, fracked gas, none of it is being allowed across Unist’ot’en Territory near the Pacific Ocean coastline. There are other paths being walked. People can now raise a clear voice in opposition to further moves to negotiate a final agreement that no one has any mandate to work on. We must reject the collaborative model succinctly for the tar sands, whether expressed by pipeline deals or in Alberta and Saskatchewan at the source of developments. The impacts globally from setting a North American tar sands collaborative process in motion could irreparably damage resistance to tar sands in places where it is now just getting off the ground around the world. The current Big Green structures are undemocratic and cloak and dagger in appearance. The participants are organizations and certain individuals with a history of bad democratic practice and serious pro-corporate sympathies. There comes a time, as has been said, when silence is betrayal. Let this be known as just such a time. Let us celebrate the existing diversity of the movements in opposition to tar sands and fossil fuels, and that have targeted the immediate, essential need to make clear the impossibility of parceling the land as a solution. We must make certain solidarity is a true bottom line for those who are seen as allies in the battles over tar sands and climate. Solidarity cannot come from secret conversations with the enemy. Let us speak too, of this reality: Big energy is the enemy. Not bad practices within it, but the energy and growth economy itself. The equivalent of the Canadian Tea Party crowd has filled newspaper columns with stories to frighten you and I about the power of American money. Much of the foundation-led anti-tar sands cash has been coming from the United States, and as such we are supposed to cringe at the origin. Yet it would not matter if the paper trail led one to the moon– resources in and of themselves are not the issue. Were spending resources to be the issue, big energy companies and the federal government within Canada itself have vastly outspent the foundations on both sides of the 49th parallel, promoting unfettered tar sands. The problem is the distortion of active resistance, and the hi-jacking of a public process. These are battles that determine whether or not we can make a grim situation survivable. Capital has caused this near calamity, we surely need to stop trying to save it from itself any longer. Capital has also polluted our own thinking– and actions– from within. We must reinvigorate a democratic environmental movement through a refutation of back room deals– and organize active resistance to those who would try and negotiate one. Where’s the Democracy in the Environmental Movement? The signing of the Canadian Boreal Forest Agreement. Greenpeace activists and volunteers didn’t know this was the framework they were organizing in. Greenpeace Forest Campaigner Richard Brooks, Stephen Kallick of the Pew Environment Group, and Avrim Lazar, Forest Products Association of Canada. With tar sands, fracking and mining all on the rise, there’s never been a more important time for a strong environmental movement in Canada. Surveying the landscape of organizations, one thing is missing: democracy. Which is to say, meaningful informed participation among equal participants. The images are familiar. People gathered together, making pivotal decisions about their collective direction in community halls, church basements, and conference rooms. Heated debates, pivotal votes, historic gatherings and galvanizing speeches. These are symbols of something that is basic to what it means for people to band together to fight powerful forces and change things. Movements often have an organization that embodies their spirit. The US civil rights movement in the 1960s was driven forward by the Southern Christian Leadership Congress and the Student Nonviolent Coordinating Committee (SNCC). The anti-nuclear direct action in the 1970s had the Movement for a New Society (MNS), and the “antiglobalization” movement of the 1990s and 2000s was an interwoven web of spokescouncil meetings and coalitions. Quebec’s epic student strikes in 2005 and 2012 were initiated by the Association pour une solidarité syndicale étudiante (ASSÉ). These and many other movement organizations made historic decisions democratically. They chose their leaders, or chose to have spokespersons instead. They debated, analyzed and decided on strategies and actions. It may not have been perfectly equal, but everyone agreed on the intention. Today’s environmental movement in Canada is different. There are a few small, member-based, grassroots groups, but there is nothing on the scale of SNCC, MNS or ASSÉ. These groups organize local events and actions, but lack the scale to set the direction for national or even provincial campaigns. The only national-level groups are Environmental Non-Governmental Organizations (ENGOs). ENGOs are somewhat diverse politically, ranging from the David Suzuki Foundation, whose chair moonlights as a consultant for Shell Oil, to the Indigenous Tar Sands campaign, which fights for Indigenous sovereignty as the best way to stop environmental destruction. But almost all of them have a two things in common: their staff-driven structures depend on foundation funding, and none of them hold meetings where a membership meaningfully and democratically sets the agenda or selects leadership. Instead, strategies for Canada’s environmental movement are formulated at island retreats, in boardrooms, and on staff conference calls. You won’t find any public record of these decisions, and if you do, someone will likely get in trouble. Local activists and community members are enlisted to be a part of campaigns, often at the last minute, but are shut out of the larger discussions. So, who makes the decisions for Canada’s environmental movement? The lack of transparency makes it impossible to know for sure, but the handful of foundations that ENGOs rely on for funding have considerable sway. A leaked 2008 strategy paper for the “Tar Sands Coalition” illustrates the power dynamic. Michael Marx, who was the director at the time, authored the document. In it, he declared that the “coalition,” which sets the overall strategy for anti-tar sands activism by ENGOs, “shall remain invisible to the outside.” “Foundations investing most heavily in the campaign,” Marx explained, “have a vested interest in exercising some control over the process.” And that’s why they created an invisible coalition of ENGOs who depend on them for funding. That coalition exists today, and continues to hold secret meetings to decide on the future direction of anti-tar sands work. At a week-long retreat attended by ENGO reps last fall, participants agreed to not talk about what was decided at the meeting, or to speak about the individual who is in charge of the “coalition,” who controls the distribution of a few million per year in foundation funding. This is not to say that ENGO staff, many of whom are idealistic, highly competent people, don’t have any influence. It is to say that activists, members of the public and residents of directly affected communities have no direct influence at all if they’re not occupying staff positions. In their quest for “exercising some control,” funders are continuously driving a wedge between ENGO staff members and all other movement participants. It wasn’t always this way. The environmental movement made far and away its largest gains before foundation funding entered on to the scene. Starting in the 1960s, environmental activism became an massive phenonenon, with 20 million people participating in Earth Day 1970. Hundreds of groups sprang up. Many of the larger ones, as Naomi Klein recently put it, had “elite roots.” But grassroots, community-based groups came up with the most impressive victories. The movement was powerful enough to make then-President Richard Nixon — of all people — enthusiastically sign the largest pieces of environmental legislation the US has seen before or since. Logging companies, nuclear energy advocates and polluters were on the run from hundreds of dedicated volunteers and small organizations. In the 1980s, foundations like Pew Charitable Trusts began to funnel resources to the most moderate and authoritarian environmental groups, balooning their capacity in relation to lean, local volunteer-based groups. The effect was to reign in activism by demanding less and less while spending more and more. Environmentalists started talking about landing jobs instead of participating in a movement. In the 1990s, the foundations — led by Pew — landed in Canada. Many groups already had top-down, non-transparent leadership structures. Some, notably Greenpeace, had recently made the decision to adopt a more authoritarian style. But there were some holdouts. Groups with large, active memberships like the BC Sierra Club, were pulled in with the promise of funds. As Mehdi Najari, a former BC Sierra Club board member told me recently, the BC Sierra Club barely had two staff in the 1980s, but regularly packed out auditoriums across the province during public meetings. Thousands across BC were participating on a volunteer basis. Democracy in member-based groups gave way to grant-dependence. Some groups simply used their top-down structures to mold themselves into the image foundations desired. Foundations created entirely new groups like ForestEthics, separate from any membership or popular mandate. Corporate collaboration became the order of the day. The new game plan was a two step campaigning model. Step one: mobilize a noisy public campaign with lots of volunteer energy to stop destructive activity carried out by corporations. Step two: stop this campaign in its tracks, and enter into negotiations with those corporations behind closed doors. The result was deals like the Great Bear Rainforest Agreement and the Canadian Boreal Forest Agreement (CBFA). In both cases, activists involved in the campaign had no idea what the overall strategy was, and were surprised when foundation-coordinated groups yanked funding for organizing and entered negotiations. While one might imagine that there is some upside to centrally-controlled campaigning, the results are not promising. Both agreements were trumpeted as quantum leaps for conservation, but in fact represented very limited gains. Ten years in, the Great Bear Rainforest Agreement (which infuriated local activists for its low-ball conservation requirements when it was signed, prompting Rainforest Action Network to withdraw its name) is still not being fully implemented. Four years after its signing, the CBFA is in disarray after Greenpeace and Canopy withdrew. Greenpeace is being sued for $7 million by forestry giant Resolute. This limited vision is built in to foundation funding. Some foundations like Pew have strong ties to oil companies and have a track record of investing in the same corporations they supposedly are working on stopping. Some, like Rockefeller Brothers Fund, have historic ties to oil companies. Some, like Hewlett, position themselves with green energy. But with very few exceptions, they are run by powerful people with deep social and financial stakes in maintaining the aspects of the status quo which benefit their class. Greener capitalism is the overall goal. Large foundations seek to legitimize capitalism by giving it a friendlier face. (Some radical foundations exist, but they are much smaller.) As one might expect, maintaining an economic system that gobbles up resources and generates ever-increasing consumption while also trying to be more environmentally friendly usually amounts to doing very little indeed. Though it is so often in direct opposition to foundation funding, democracy has many benefits. When thousands of people are involved in debating and deciding on strategies, the sense of ownership and investment they feel marks the difference between holding a banner and being a part of a process of societal transformation. Direct experience, whether with whooping cranes or a refinery next door, can transform people and unleash creativity within movements — and if we’re lucky, within society at large. Working at the pace of volunteers instead of full-time staff also opens the door to a more diverse set of participants. Elders, parents and students can be a part of the mix, bringing their unique energies and wisdom. The most important benefit of democracy is the ability to change direction and leadership collectively. Right now, Canada’s environmental movement is a large collection of individuals. Each participant has their own thoughts and opinion on the overall direction of the movement, but none of us has a venue to express that opinion collectively or do something about it collectively. It’s a fundamentally disempowering situation. Every other movement has had to deal with a wide array of organizations who are in some way at odds with the core of activists pushing things forward. The Civil Rights movement had the legally-oriented NAACP opposing direct action tactics. ASSÉ had to fight FEUQ during both student strikes while it fought the Quebec government at the same time. Having moderate groups around who try to slow things down and blunt the edges is nothing new. But Canada’s environmental movement is in a more exclusive club: movements which have no independent democratic venue which includes activists and volunteers. Where is our ASSÉ? Where is our SNCC? We have nothing like them. This, I should say, is not a new problem. 16 Greenpeace founders signed a letter declaring that “Greenpeace’s leaders are paid too much, have lost their focus and must become more democratic.” That was in 1996. The struggle for a democratic movement is a long haul, but the need which drives it is nonetheless pressing. The shadowy foundation-controlled Tar Sands “Coalition” has launched the “Tar Sands Solutions Network,” a name that strongly hints at future corporate collaboration deals coming down the pipe. While many of the individuals receiving the funding are surely against this. Indeed, one prominent tar sands campaigner has been quoted as saying he’ll quit if corporate dealmaking comes to the tar sands. But is that enough to change direction? Only time, and silent struggles within the coalition, will tell. That is, unless an independent, democratic alternative emerges. An unfortunate side effect of foundation money coming to Canada every year is that it makes starting truly democratic grassroots efforts much more difficult. The expectations of staff pay and resources are much higher, and talented organizers tend to get picked off and hired by ENGOs. Often, they take their social networks with them. The most successful movements in history thrived without foundation money. Without them, the world would look very different today. The first step is a developing a recognition of the need for a democratic venue where movement participants can make decisions independent of foundations. The second is finding the will to build it.